We specialize in manufacturing various kinds of flexible tubing for public telephones, communication appliances, and bath equipment. We also produce telephone hand sets and payphone parts. Our products has now extended into public restroom hardware. 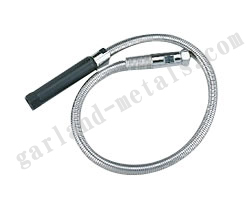 Garland supplies the international market with high quality reinforced flexible tube. We have passed tests and standards set by American Bell Lab. Our quality products have allowed us to partner with many well-known companies worldwide. We welcome new business cooperation and product development with related clients. Please visit to our homepage or contact us for more information.